Biblical content and fun: after hearing about the Spirit of Pentecost the confi-starters make their water rockets in the Repair Café. “Wow” was the outburst from Justus and Justin, both laughing. The two nine-year-olds had just fired off a rocket, although no fire was actually involved. Victoria, too, watched the flying object go up with a mixture of amazement and pride. After all, it was she who had built the rocket, which was then filled with water and compressed air and took off thanks to the principle of jet-propulsion. But she had certainly not reckoned with their water-powered rocket reaching the height of the roof of the neighbouring house, several floors high. 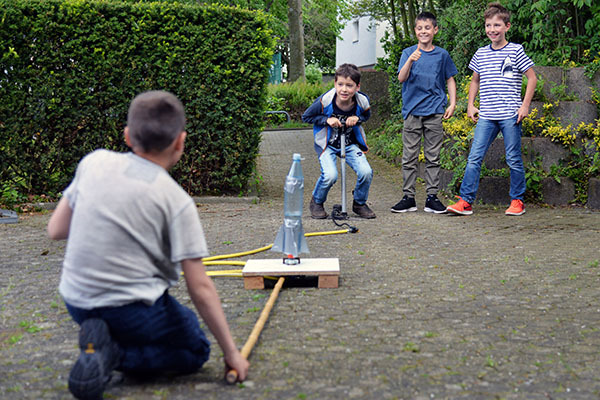 The three children were part of a ten-strong confi-starter group at the Emmaus Church in Aachen and had built the sky-storming rocket from craft materials in one of their group sessions on Sunday, after they had been hearing about the Spirit of Pentecost. In past years there have been on average ten young people coming to the weekly confirmation classes in the church hall, which is situated next to open fields in this otherwise densely built-up part of town – but with huge fluctuations. Some years there would be 15, but the following year only five. Monica Schreiber has no illusions about it: “Confirmation education has suffered a considerable loss in importance”, she says. She is much encouraged by the initial experience of the confi-starter. After several sessions of story-telling and play, taking place on Sunday in parallel to the worship service, as well as exciting family activities such as a visit to the zoo with the theme of creation, or a church rally, both children and parents seem to take church life much more for granted and feel that they belong. “Family Services have been well-received and they are happy to stay to coffee afterwards, while some have joined the family circle or visit other things on offer for the children. And the children have also got to know some of the church members who belong to other groups”, she reports. Such as Cord Elias. He is a volunteer who leads the Repair Café in the church, where experienced hobby craftworkers offer guidance to other church members on making small repairs. On this particular Sunday he is helping the confi-starters to build their rockets. With his help they are using a bandsaw to saw off the base and neck from plastic bottles and to stick these together with another bottle to make into those water rockets which are finally able to investigate the roofs of houses and the tops of trees in the surrounding area. Educational jargon calls this an ‘experiencing of self-efficacy’. The children call it fun. They are all very enthusiastic about joining in. Getting to know other groups in the church community is a core part of the concept of the confi-starter. This might be the pensioners group just as much as the families from the neighbouring St Katharine’s Catholic Church - for the programme has been planned ecumenically. The confi-starters and the first-communion candidates meet up regularly for joint activities at their preparation sessions which are scheduled to happen at the same time. For example, for a dawn walk together with their parents. The original idea of the confi-starter comes from the Regional Church of Hannover, where the model is extremely widespread. But Schreiber believes that “This ecumenical approach is perhaps something special”. Anyhow, for well over a year now the two congregations have come much closer together – the Catholics regularly celebrate Mass in the Emmaus Church, because their own church is in a dilapidated state. And so it was obvious to bring the children together as well. They already know each other in any case from school or from being neighbours. “Here in this predominantly Catholic town of Aachen the Protestant children have already been wondering why it is that nothing is offered for them, while their Catholic friends are being prepared for their First Communion.” For Schreiber this is yet another good reason for bringing the period of preparation for confirmation forward by a few years. But not, of course, the confirmation itself. The current confi-starters will receive a further invitation in four years’ time to come along to the second stage of the confirmation education programme. They will receive the invitation in an envelope which they have prepared themselves with pictures of their positive memories of their time as confi-starters. “Hopefully they will remember this as a good time”, is the hope of Monica Schreiber. A water rocket was also to be seen on the envelope. Or perhaps a monster with a wide grin, or one peeping shyly round the corner. This is because the story-telling session on Sunday always begins as follows: The children leave the congregational service of worship after the first hymn, carrying a candle, and then squat down on the ground with the three volunteers, Rike Odrian, Jamaina Frank and Gunda Lochau-Schwake around the candle, and start by talking about how things are going for them, with the help of pictures of monsters. Julius chooses a happy one, Victoria a shy one, Both of them really love this recurring ritual. “I like showing them how I am.” says Victoria. “It’s good to know how others are feeling” says Julius. After that there is a Bible story, sometimes a game, sometimes doing craft work or having a snack together. They have a good time in each case, as the children unanimously affirm. And so the most important aim of the confi-starter is achieved during this first year: they experience church as a place in which they feel comfortable and with which they can be involved. They regard the Emmaus Church as their own church.